Top Currencies Vs. Gold: Which Fiat Could Beat Gold in 2017? This is a traditional post with a performance review of top currencies versus gold at the end of the year. The fiat money is represented by 7 currencies: US Dollar (USD) and 6 components of the US Dollar Index (DXY) placed by weight: Euro (EUR), Japanese yen (JPY), British Pound (GBP), Canadian Dollar (CAD), Swedish Krona (SEK) and the Swiss Franc (CHF). This year the gold was almost as strong as last year compared to the top currencies and only one rival could escape from its death grip. The Euro was also very strong this year as the Euro Index scored a hefty 7.26% gain against its peers (USD, GBP, JPY, CHF). It helped the euro to outweigh gold by 2%. Last year the EUR finished on 5th place. 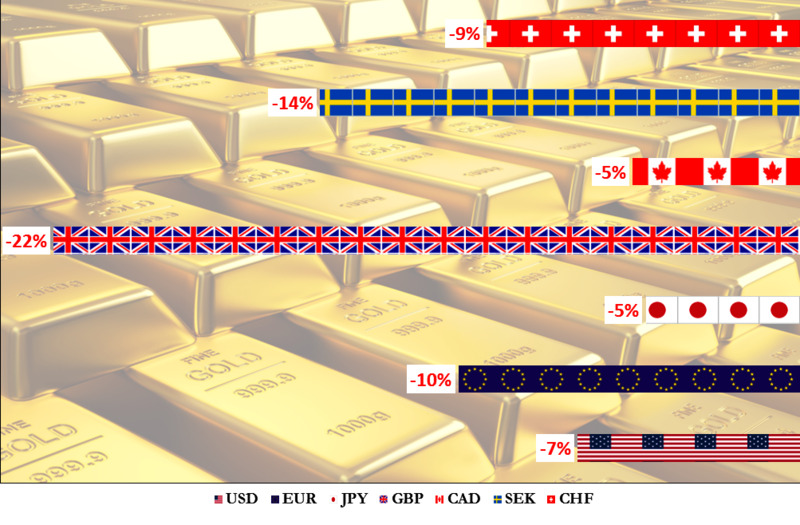 Posted in INO.com ContributorsTagged British Pound (GBP) Canadian dollar (CAD) Gold (FOREX:XAUUSDO) Japanese Yen (JPY) Swedish krona (SEK) Swiss Franc (CHF) US Dollar (USD) US Dollar Index (DXY)12 Comments on Top Currencies Vs. Gold: Which Fiat Could Beat Gold in 2017? Top Fiat Money Vs. Gold: What Shines Brighter in 2016? It becomes a tradition to post a performance review of the top currencies vs. gold at the beginning of the new year. Fiat money is represented by 7 currencies: The US dollar (USD) and 6 components of the US dollar index (DXY) placed by weight: euro (EUR), Japanese yen (JPY), British pound (GBP), Canadian dollar (CAD), Swedish krona (SEK) and the Swiss franc (CHF). Posted in INO.com ContributorsTagged aibek burabayev British Pound (GBP) Canadian dollar (CAD) Euro (EUR) Gold (FOREX:XAUUSDO) Japanese Yen (JPY) Swedish krona (SEK) Swiss Franc (CHF) US Dollar (USD)1 Comment on Top Fiat Money Vs. Gold: What Shines Brighter in 2016? A year ago I wrote a post to compare the top currencies dynamics against Gold inside of the year. Today I want to repeat the experiment to see which one could beat the safe haven and which one couldn't. This time, you will see a modified version of the chart where the inverse metal crosses show not Gold's (last year version), but the currencies' dynamics for easier eye perception.